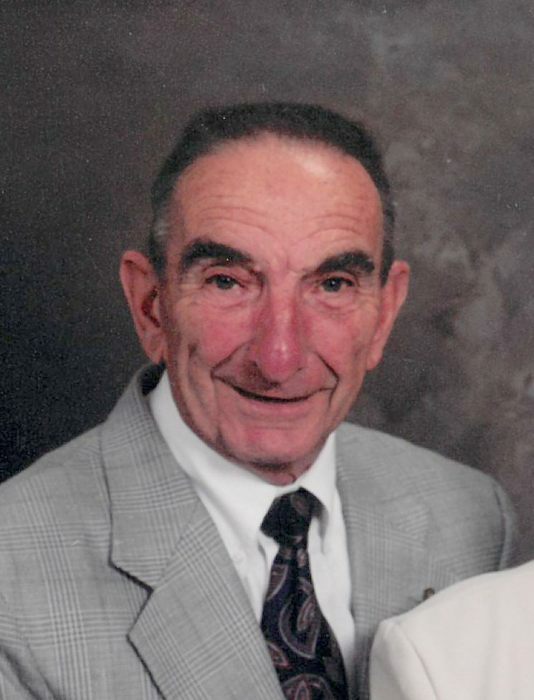 SHERWOOD – Kenneth N. Kress, age 93, passed away on April 5, 2019, after a long battle with Alzheimer’s disease, which robbed him of hitting his goal of living to the age of 100. He is finally free. Ken was born in Cleveland, WI on September 18, 1925, the oldest son of Edward and Eleanor Kress. On October 28, 1950, he married Betty Tupper. They celebrated 68 years of marriage and were blessed with six children. On November 1, 1951, Ken moved his family to Sherwood, purchasing a small feed mill, Sherwood Elevator. He was very proud that his three boys, Klair, Kurt, Klay and daughter, Karol have successfully carried on the business. Once in Sherwood, he became active in his new community. Ken held many offices in his church and also ushered for over 50 years at Sacred Heart. He also served on many feed company boards. Ken was the last charter member of the Sherwood Lions. He was a member of the first village board when Sherwood was incorporated in 1968, holding that position for about 25 years. Ken was a volunteer fireman with the Sherwood-Harrison Fire Department. He was proud to have served most of these organizations for more than 50 years each. Ken and associates were also instrumental in developing two Sherwood subdivisions and the Sherwood Forest Golf Course. Ken was a big fan of the Milwaukee Brewers. He played baseball himself for many years as a catcher. Ken played a huge role in bringing youth baseball to the community and was a coach and mentor to many young boys playing ball, including his three sons. Ken and Betty were very fortunate that they were able to travel extensively throughout the United States and also to many countries abroad. Ken is survived by his wife of 68 years, Betty Kress; six children: Karen Mader, Klair (Julee) Kress, Kris Halbach, Kurt (Sue) Kress, Klay (Mary) Kress and Karol (Gary) Thiele; 22 grandchildren; 50 great grandchildren; three great great grandchildren; sisters: Marion Hanson, Mary Ann Raduenz, Joyce Kress and Aggie (Dan) Deehr; brother-in-law, Lloyd Tupper; many nieces and nephews. In addition to the deaths of his parents and wonderful step mother, Anna, Ken was also preceded in death by two sons-in-law: James Mader and Patrick Halbach; brother, Don Kress; a sister, Delores (Harvey) Hanson; brothers-in-law: Sheldon Gordon, Virgil Hanson, Erle Raduenz, Wallace Tupper and Warren (Emily) Tupper; and one great great grandchild. Visitation will be held on Tuesday, April 9, 2019, from 4:00 p.m. until 7:00 p.m. at the Verkuilen-Van Deurzen Family Funeral Home KAUKAUNA LOCATION, formerly the Boettcher Funeral Home, 2401 Fieldcrest Drive, Kaukauna. The evening will conclude with a service. Visitation will continue on Wednesday, April 10, 2019, at Sacred Heart Catholic Church, N369 Military Road, Sherwood, from 9:30 a.m. until the time of the Mass at 11:00 a.m. Interment will be in Sacred Heart Cemetery, Sherwood. In lieu of flowers, a memorial is being established in Ken’s name that the family will use to further Alzheimer’s research. For online condolences, please visit www.verkuilenfh.com. The Kress family would like to extend a special thank you to the care givers at Aspire Senior Living, especially Kim, and to the Ascension Hospice Group for their compassionate care.